Si Yu’os Ma’ase means thank you in Chamorro, the language of the people of Guam and the Northern Marianas (CNMI). It is also much more than that, because while it translates to a thank you, it is also a phrase that wishes God’s grace upon an individual when spoken or told to. The Gerard Aflague Collection has taken this phrase and elegantly created a number of beautiful folded cards, note cards, and envelopes, with embossing and gold printing to impress those that receive it. Perfect for business, personal, and any occasion where you would want to send a message of thanks to others embodied in the Chamorro language. It was my desire to create Chamorro Si Yu’os Ma’ase Thank You cards that embody an elegance that has not been created for islanders or islander connected folks across the United States to purchase online. This elegance is also a beautiful message on paper because it is a blessing as well as a thank you. Printed in gold foil, with embossing, these products are nothing short of beautiful. Our products are perfect to attach to gift baskets, to send a message to that special someone, or to attach to party favors at weddings, baptisms, and engagement events. It’s also appropriate to send out to those that may have supported you during a loss. This is probably the best way to send your chen’chule to others since it is more than just sending money in an envelope, it sends God’s blessings as well. To add to our envelope collection, we also carry stationary to send out personal thank you letters to those you care about. 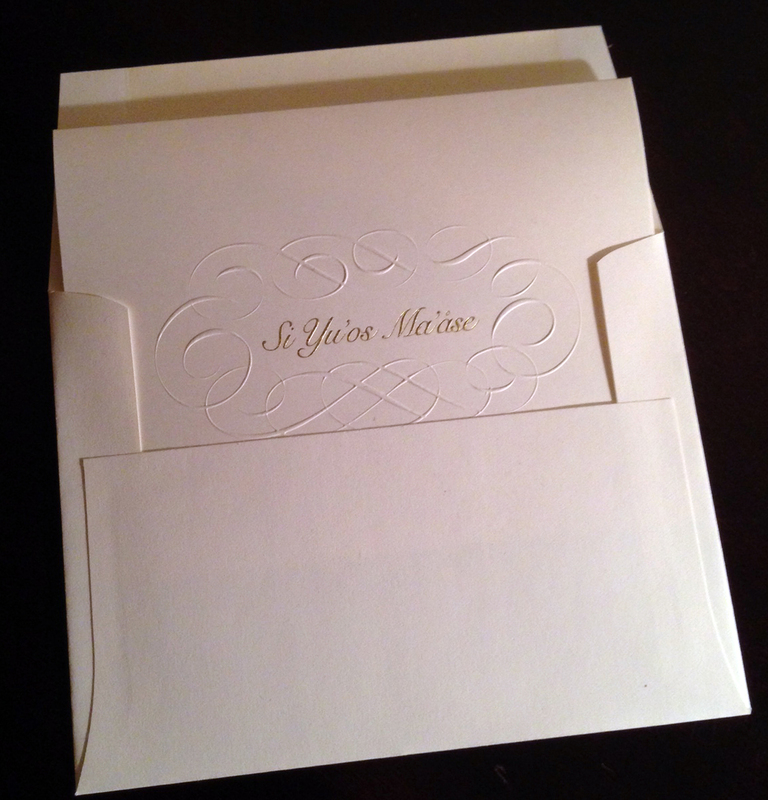 We offer an 8-set Si Yu’os Ma’ase Thank You product that includes a gold leaf, embossed folded card, note card, and matching envelope. We also have both personal sized stationary, and business sized stationary with matching envelopes that will allow for more writing space if your message requires more space than what a note card offers. If you need just notecards for gift baskets or to put on tables at a wedding with chocolates, we have that too. Here are the links to our products.